The history of the Peace Operators began in the 80s, with sponsorship by the then seminarian Mina Morosini Ms Maria Joji Rai. From Rome, where he had just taken his vows, the new priest came to Seriate to know your “Mom” adoptive, entering at that time in contact with Don Piero and others who encouraged him to accept some children in severe poverty in the parish that he would be given. 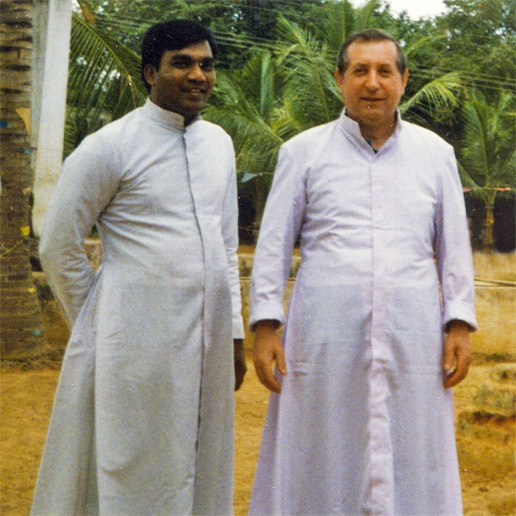 The work of Father Mary begins in 1989 in the parish Allipalli, including 15 villages inhabited by an estimated population of 30-40 thousand people, devoted almost exclusively to agriculture employed by some landowners. The conditions of the population were – and are largely still is – characterized by extreme poverty: the daily rate barely allows to consume one meal a day, rice and vegetables; the houses were – and still are in the majority – represented by huts made of palm leaves, resting on a base dirt; medical care was virtually nonexistent, with dramatic consequences on infant mortality and average lifespan (estimated at around 50 years). In the month of October 2013 Father Maria has had the opportunity to meet Pope Francis who gave an association booklet. The Pope congratulated and has lovingly blessed . A nice way to Father Maria to celebrate his 25th anniversary of priesthood celebrated in December. which has enabled us to achieve so many beneficial initiatives so far, is indispensable for our work.